You don’t know what to do. You feel completely paralyzed here, your energy diffuse as it travels far away from your body into a million different directions. Like hundreds of energetic threads reaching out from your body, you check your decision against the multitude of variables. How will this impact me in a year? Five years? Ten years? At the end of my life? What will my mother think? My partner think? What will they whisper about me in the corridors or at the grocery store? What if, no matter how hard I try, I’m still not good enough? Days pass, as you run over each individual situation and thread in your mind, mulling over the pros and cons, and waiting until you have a definitive answer. All the while you cannot deny the restlessness building in your body, the itching hunger to just DO SOMETHING ALREADY, but you feel undeniably caught between these two world – the worlds of comfortable life as you know it and the brilliant whisper of something more. If you are a person that has been blessed with the well-crafted ability to thoughtfully navigate your life, considering each next step from every angle before leaping, it can be very difficult to proceed forward. The thoughtfulness, which on one hand allows you the brilliance of self-awareness and the empathy to traverse difficult territory in relationship with others, holds you in the place of inaction – tethering you to the multitude of possibilities that every circumstance and situation provides. The truth is: You may never feel fully ready. You may not ever be entirely resolved about quitting your job or going back to school or leaving your relationship. You might not be entirely comfortable with your yearning, even when you cannot deny it’s existence. And, in thoughtfully probing your discomfort, it is possible – likely even – that you are making your indecision mean that there are holes in your desire or that you should wait until you feel absolutely certain before moving onto the next step. I have never felt fully ready to do anything that I’ve done in my life. I was not ready to go back to school to get my masters in social work. I was not ready when I decided to marry Cookie. I was definitely not ready to start my business. My path is riddled with distinct not-readiness, and yet, it is also filled with many moment of moving forward and taking action even when I was terrified that I might regret my decision five years down the line. The truth is: We can only make the best decision possible for us, with the tools we have on hand. We do not know where our lives are taking us. We do not know who we’ll be five years down the line. We have no ability to spin ourselves far out into the future, like a spider traveling those threads of energy far away from our bodies, and return with certainty or concrete knowing. What we are left with is our desire – our capacity for trusting that, no matter what happens, we will be able to take care of ourselves. We are left with our divine knowing, that chasing the path of the things that light us up is moving us in a direction that is deeply healing and nurturing for us. Walking that path, making one small choice to honor our spirit and then the next, is the way that we cultivate lives that honor us, that are distinctly and irrevocably ours. In this moment, you cannot know how your next choice will impact the trajectory of your life, but you can know whether or not it is the right choice for you. You can pull at those threads, calling your energy back to your heart, back to your intuition. But it requires the chutzpah to take responsibility for your daily reality and a desire to live a life that is divinely yours. This is your path. Your parent’s opinions do not matter here. The shock and horror of your nameless, faceless Facebook audience or the gossiping old ladies in the line at the pharmacy in your hometown do not matter here. The confusion of your partner does not matter here. What matters here is your voice – and standing in your own power when you actively choose to participate in the creation of your own life. Do this: Call your energy back to you and promise yourself that you are going to focus JUST on the next best decision. Do not allow yourself to worry about how this decision will impact the vast, wily path of your life. Make the next best decision for yourself based on everything you know to be true about yourself in context in this moment. Trust in your ability to know yourself. Trust that your joy – the joy that comes from building a life that reflects you – will feel really good. And I promise, it will feel much better than a life lived for everyone else – even if it doesn’t feel that way right now. Allow yourself to practice this. Start with small choices – small moments of decision – and work your way up to bigger choices. Reclaim pieces of yourself and pour it into every action, building your self-trust with every step. Ask yourself: What feels best for ME here? What do I want to do? What might I choose if no one had ever told me what was “right” or “good” or “best”? Borrowed from Alcoholics Anonymous, this phrase has skipped into my heart, taking up cozy residency there, bolstering me with each utterance. Use this phrase whenever you feel the urge to spin out on those million threads or find yourself spinning around and around as you wonder whether or not you’ll be able to keep it up for the long haul. Just for today, I will speak kindly to my body. Just for today, I will move joyfully for 30 minutes. Just for today, I will stand in my power. 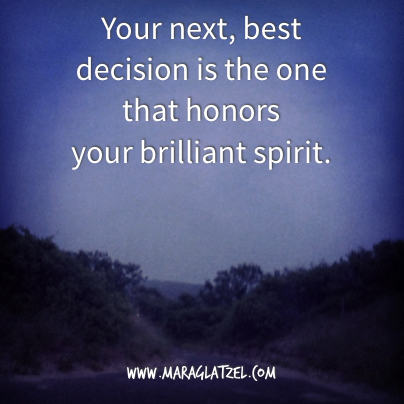 Just for today, I will make choices that honor my spirit and light me up at the core. There is no need to promise that you will be able to keep something up forever or wait for the epiphany that changes EVERYTHING, suddenly allowing to to dig into a new way of being with permanent ease. We are all practice here. We are all humans here. We are all experimenting with finding new ways to come into energetic alignment and standing in our personal truths. Just for today, trust in your ability to make decisions that allow you to feel really good. Do this: Allow yourself the freedom of one inspired action. An inspired action is a small step forward. Instead of sitting with the enormity of your big dream in your hands, telling yourself that in order to be successful you must do it all at once, start small. Put your feet on the ground, put your hand on your heart, and ask yourself: What is one thing that I can do today to get me a little bit closer? Don’t judge this small step. After all, one step is decidedly better than no steps. Take that one step and then, when you’re ready, take another. Allow the inertia of empowered action to push you just a little bit further down your path. These small steps stack up quickly, allowing yourself the fortitude of forward momentum where you might otherwise stay stagnant and overwhelmed for months or years. You do not have to do it all at once. Start where you are. Choose your next step.